Q: Does anybody know where to find (if there is)a CD with the music band of this movie? This was a terribly uninteresting film. In fact, I had to struggle with myself not to just turn it off. The story wasn't particularly compelling, the acting was only so-so and the choice of casting was strange, to say the least. At first, I was shocked to see that the part of Don Juan was played by a fat old guy with a bad hairdo. Later, I realized that was probably the type of dissipated character they wanted for the film. However, this confused me still for two reasons. 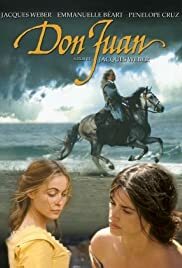 First, women in the film still found him attractive (yuck) AND Don Juan's father, played by Michael Lonsdale, looked almost the same age as Don Juan. It just didn't make sense. In addition, the movie sported some excellent actresses that had little, if any, chance to show off their talents. Emmanuelle Béart is a tremendous actress, but here she is just seen in bits and pieces. Penelope Cruz also appears in the film--very briefly. With both women you assume they will be integral parts of the film, but they are wasted. Instead, Don Juan mostly whines to his manservant and talks to a giant busts of a man he killed. Wow--some excitement.